The pH is a measure of the acidity of the water. The pH scale goes from 0 to 14, where pH 7 is neutral. 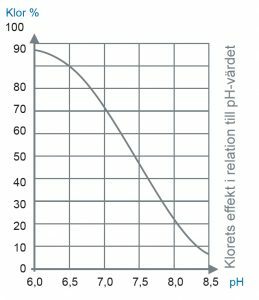 If the pH is above 7, the water is basic; if it is below 7 the water is acid. The optimum pH for pool water is 7.4, since this is the same as the pH in human eyes and mucous membranes. A pH of 7.4 also gives good chlorine disinfection. The guideline pH figure is 7.2 – 7.6. To lower the pH, use sodium bisulphate; to raise it use sodium carbonate. Chlorine compounds may provide organic or inorganic chlorine. Organic chlorine is trichlorisocyanuric acid (for weekly chlorination) and dichlorisocyanuric acid (dissolves rapidly and is suitable for small pools). Inorganic chlorine is calcium hypochlorite (for daily and shock chlorination) and sodium hypochlorite (liquid). When a pool is dosed with either organic or inorganic chlorine it is free chlorine that attacks bacteria and contaminants. As the chlorine acts it is converted into combined chlorine. Combined chlorine (also known as chloramines) is ineffective, smells of chlorine and may cause irritation of the eyes and mucous membranes. To reduce the combined chlorine, the pool is shock chlorinated with calcium hypochlorite. The high chlorine content that forms temporarily on shock chlorination disappears quite quickly in an outdoor pool, but can also be lowered with chlorine reduction compounds. Chlorine is continuously consumed in the pool, and different factors determine the chlorine consumption, including bathing frequency, water temperature, sunlight and pool size. A test kit is used to measure the chlorine content. Most kits measure free chlorine, but to measure the combined chlorine you need to measure total chlorine. Total chlorine is the sum of free and combined chlorine. If organic chlorine (weekly chlorination) is used, cyanuric acid accumulates in the pool. Where the cyanuric acid content is above 100 ppm (mg/l), chlorine blocking may occur, making the chlorine ineffective. Cyanuric acid can be removed by adding water from the mains supply. Cyanuric acid acts as a chlorine stabilizer, preventing the sunlight from breaking down the chlorine, for example. It is therefore advisable for outdoor pools to have a cyanuric acid level of 30-50 ppm (mg/l).